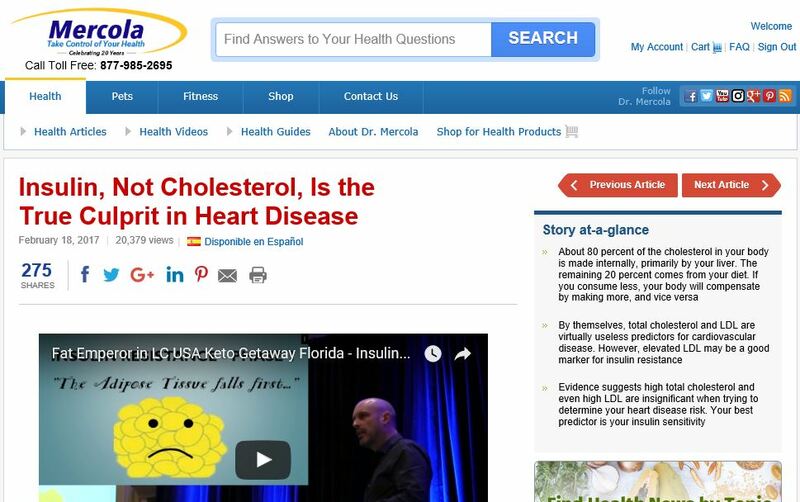 Look who just showed up on Mercola.com – Cholesterol Vs True Root Causes! Click on pic below for the post. Insulin ain’t everything, as I clearly point out in my talk. But most “cholesterol” or “dyslipidemia” problems are only a manifestation of insulin/glucose dysregulation. There are many other causal agents for heart disease too – it is of course multifactorial. But running after cholesterol is a rather silly strategy. Do as an informed engineer would do – focus on the primary drivers ! Myself and Dr. Jeffry Gerber (http://denversdietdoctor.com/) will have a book coming out late in 2017 with this and much more analysis of how to live long – and with healthy vitality to the end! Please subscribe (always for free) to www.thefatemperor.com/subscribe for future (always free) content…!